This entry was originally posted at http://isabelladangelo.dreamwidth.org/1163404.html. Please comment there using OpenID. Last sewing project of 2016 up! I've written up the entire dress diary entry over on blogspot. It's a super fun dress. 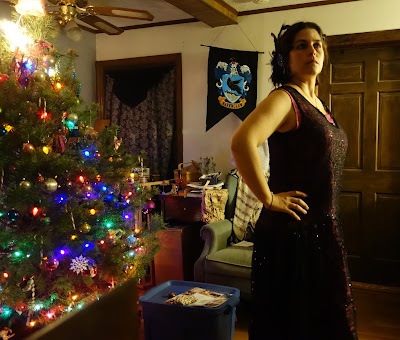 I wore it with modern undies - ie, not 1920's. The only issue I really had with the dress is that black lace snags on absolutely everything. However, it wasn't that much of an issue and it was easily dealt with so, eh. This entry was originally posted at http://isabelladangelo.dreamwidth.org/1161316.html. Please comment there using OpenID. This entry was originally posted at http://isabelladangelo.dreamwidth.org/1160992.html. Please comment there using OpenID. This entry was originally posted at http://isabelladangelo.dreamwidth.org/1160850.html. Please comment there using OpenID. This entry was originally posted at http://isabelladangelo.dreamwidth.org/1158312.html. Please comment there using OpenID. Fabric Mart is having one of their sales. It's 50% of all their silk which means $15 a yard. Not bad but not great either. Still, I found a color I loved and bought the remaining 8 yards. :-) There is also a teal/sand striped silk taffeta for $9 a yard. It's not everyone's color choice but the stripes look perfect for 18th C.
Mostly drapery fabrics but some pretty good buys as well. Fabric dot com has all the things. They used to be awesome but Amazon bought them out so now that Steve is no longer in charge, the coupons aren't fast and furious anymore. Denver Fabrics and Fashion Fabrics Club are the same store. Denver fabrics was a privately owned business that got bought out years ago. Unfortunately, I've had a few bad experiences with them (they'll say something is 100% wool and I doubt it even had wool in it!) so be wary. Renaissance Fabrics is droolable. I love all their fabrics. Of course, they are on the pricey side but it's worth it for a few of their fabrics. Syfabrics is a seller on ebay but also has a website. I've never had a problem with them and love a lot of the fabrics I've gotten. I just bought a mustard wool blend from them a couple of weeks ago. B & J fabrics probably stands for Broke & Jobless because their fabrics tend to be so $$$ that that's what you'll be. However, they sometimes have some rare fabrics that are impossible to find elsewhere. 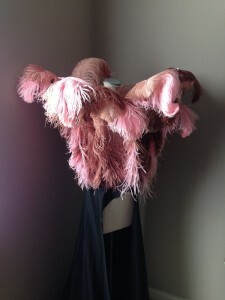 Pure silks is a great place to go if you need that specific color of silk taffeta. They aren't outrageous in their prices (about $19 a yard on average) but they are shipping from overseas so it can be slow sometimes. Dharma Trading is one I've used mainly for dyes. I know others have bought fabric from them. I've never heard a complaint. Fabric Store is where you go if you want linen. You do not bother with anywhere else - except Carolina Fabrics who only travel to SCA events. William Booth Draper is another 18th C specialty store. The website seems to be down for me right now. I'm sure I've missed a few but those are the ones I can think of off the top of my head. Anyone else have any suggestions to add to the list? This entry was originally posted at http://isabelladangelo.dreamwidth.org/1150579.html. Please comment there using OpenID. This entry was originally posted at http://isabelladangelo.dreamwidth.org/1150170.html. Please comment there using OpenID. This time, I went for a Pink Moscato out of California and it's delicious! This entry was originally posted at http://isabelladangelo.dreamwidth.org/1147500.html. Please comment there using OpenID. This is going to sound like an infomercial but I really love Rocksbox. Rocksbox is something I saw on pinterest that looked interesting but I never signed up until this month. It's the netflix of jewelery. You tell rocksbox what your personal style is and they send you three pieces every month. ...Did I mention this will sound like an infomercial? It's $19 a month which is a bit $$$ when I'm used to spending that on a piece of jewelery or two. However, I also hate buying a piece, getting bored of it after a few days or not wearing it for months. This allows me to rent pieces that I like (you have a wish list that gets saved) without storing it. I can live with that. 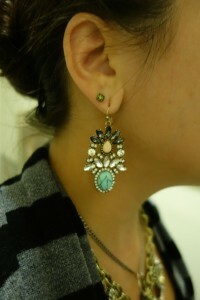 If you do like the piece (I LOVE the earrings I got in my box), you can buy them at a discounted rate. I'm keeping these. They ended up being $25 and I can't express enough how much I like them. Of course, I told the stylist I have a thing for turquoise so I guess that's why she threw these in the box. 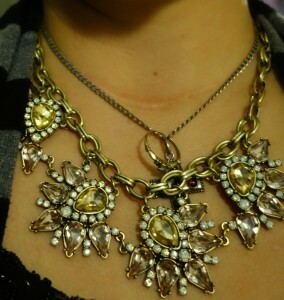 I've been wearing either this necklace or the other lovely one I got over the past week. The fun part is all the guys at work LOVE the jewelry. They all wanted to know where I got those lovely "vintage" pieces because their wives would like it too. If you want to sign up, use my code "Elizabethcbff29". You get a free month from rocksbox if you are one of the first five to use the code (it refreshes every month so every month a new 5 people get a free box). It may be about $20 a month but I'm completely sold on this idea.